The first Pirates shirts were white and red and were purchased for the team by Granville Raper and the Hunter brothers after a trip up to Nottingham’s Surfside Alpine Sports shop ……. one of the few genuine hockey shops in the country. Unfortunately for the boys, the shirts were very quickly rendered surplus to requirements as the first orange shirts soon arrived on the scene. The arrival of the first orange shirts. 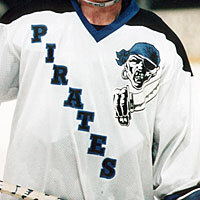 Team manager John Burke convinced his employers, Anglia Tyre Services, to back the Pirates with a new strip and the company used its own brand colours as a basis for the design. 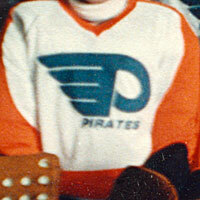 Having decided to call themselves Pirates, the team set out to look for a logo but with the P and the colour scheme, it soon became obvious that the Philadelphia Flyers had the perfect answer with their “Flying P” logo. A few tweaks and the addition of the word “Pirates” and the logo was up and running. One problem early fans had was that the orange/white/black colours were not obviously replicated anywhere so obtaining scarves and the like – the club had no merchandise in the early days – proved very difficult. Eventually, people latched onto the fact that Luton Town FC had identical colours and the remainder of that first season saw a steady stream of Pirates fans driving down the A1 to buy their Luton scarves ! 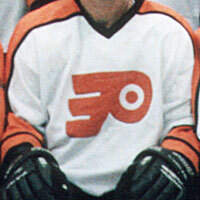 The shirt shifted to a direct replica of the Philadelphia Flyers white shirt but the logo was modified to something a little sharper. 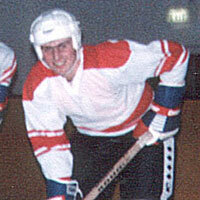 This was the shirt worn by NHL legend Garry Unger when he signed for the club in 1986. 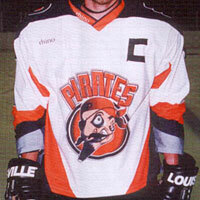 The arrival of a major sponsorship deal with British Sugar saw Pirates abandon the Flying P and the orange colour scheme to play in white/red/black with a cross-sticks British Sugar logo on the front. The famous Wembley shirt debuted in the previous season with the addition of the blue making it one of the most popular and striking shirts in Pirates history ……. one of the most successful too ! With the loss of the British Sugar sponsorship, new backing came from the Norwich & Peterborough Building Society. 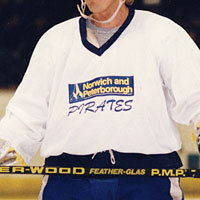 The team truly abandoned its identity this season, not only via the bland white shirt but in changing its name to Norwich & Peterborough Pirates. The natives were less than happy but Rocky Saganiuk took the shirts back to Wembley so the season certainly had its positives. 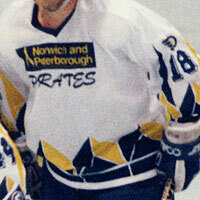 Continued backing from Norwich & Peterborough kept Pirates in the corporate colours of yellow/blue and white but the addition of the colourful trim made this a much more eye-catching shirt. 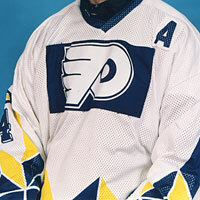 The sudden loss of their main backers left the cash strapped Pirates with yellow/blue and white shirts but unable to use the logo and ill-equipped to buy new shirts. Answer was simple …… slap a good old Flying P over the top of it ! 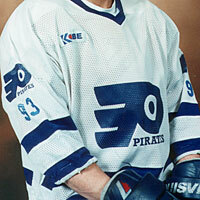 A completely new shirt for the 94/95 season introduced a nice white/blue combo and a return to the Pirates Flying P, albeit modified from four to three “wings” in a vain search for originality. 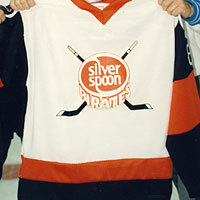 This was the shirt that greeted Randy Smith when he arrived in Peterborough in 1994. 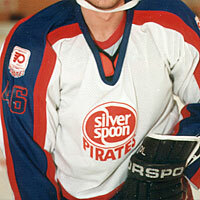 New shirt, new logo as Pirates decided to start afresh. 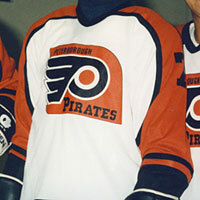 The season was a total disaster on the ice with the team, at one point, playing the “Official Farewell” to the Pirates game after money ran out. An interesting design but synonymous with very tough times for many fans. 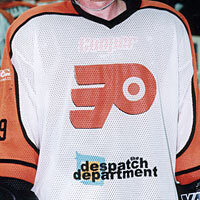 New backers, new money and a return to basics as Pirates were re-born in orange/white/black with the three wing orange Flying P. Towards the latter part of its second season, the lower front of the shirt was enhanced with the Despatch Department logo. 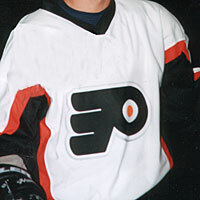 Now skating back with a red/white/black design along with a smartened up logo – which of course took it back towards its roots at Philadelphia ! The arrival of a new logo. Christened by fans as the “Jimmy”, as a nod to the pronounced chin of TV football pundit Jimmy Hill, you either loved it or you hated it but it was certainly eye-catching and, for once, original ! 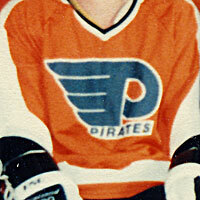 Pirates finished pretty much where they started, reverting the home shirt back to a near identical orange/white/ black design to that first worn in 1985. Jimmy stayed put, albeit reduced and mellowed to a softer orange and the shirts carried the green Specsavers logo throughout the season ……. shame they didn’t see what was coming ! 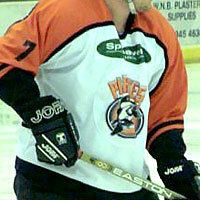 The 2000/2001 black away shirt was used again this season.